The Alliance Alive review, out now for the Nintendo 3DS. The Alliance Alive is a JRPG for the Nintendo 3DS. Created by FuRyu, and published by Atlus, it comprises of the team behind the SaGa series, who originally developed games for Square-Enix. Focusing on a traditional experience, Alliance Alive features many of the usual suspects you may come to know from series, such as Final Fantasy. As the successor to FuRyu’s last title, The Legend of Legacy, it takes cues from its own predecessor as well as the familiar turn-based JRPG storylines, battle system elements, and the types of locales you’ll see in this adventure. A throwback to a recent past. The game’s visuals feature a chibi art style. It’s a minimalistic approach to character design, but one that is familiar to RPG fans. If you’re familiar with Bravely Default, the Alliance Alive uses a similar approach. You’ll see fairly minimal battle animations. Attacks and magic are what you’d expect, but special attacks look cool. You’ll see a good animation from your special abilities, giving you more reason to use them. The world takes on an approach similar to cel-shading. It feels almost like the visuals of a pop-up book. They’re drawn backgrounds rendered into a world with 3D models. These look to be the best-looking visuals in the game. They’re the only thing that stands out as impressive as opposed to generic. 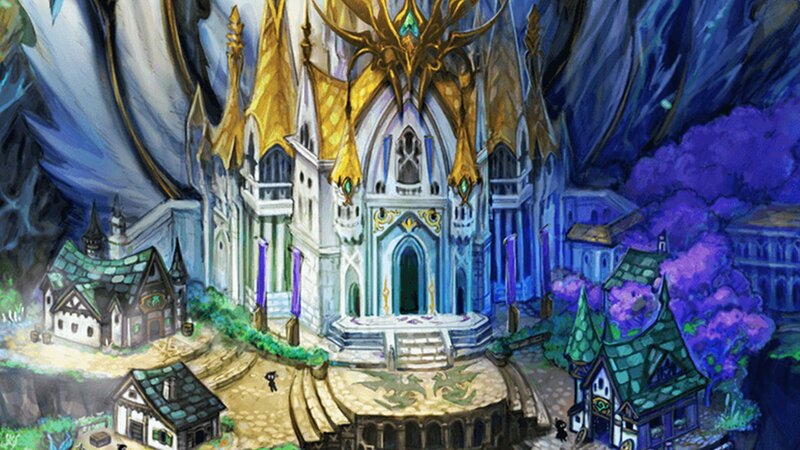 Even though it’s a take out of Bravely Default’s book, the areas are something to be admired. Over a thousand years ago, a war took place between humans and daemons. The daemons won and took over the world. Ever since then, humankind lived under the dominion of the daemons. The clouds overtook the sky and obscured the blue sky for a millenia. Now, in the current era, humans form a resistance group to try and win back their world. The daemons divided the world into several segments. The Dark Current is the name for the ocean that separates them all. Enter Gallil, a young mercenary, and his friend, Azura. They’re part of a resistance band known as the Night Ravens. Their adventures take them across the oceans and to various dungeons to find out how to overcome the Daemons, and the ordership of the Beastfolk. The story takes a turn later, introducing us to Vivian and Ignace, two daemons from the Daemon world. Vivian has an interest in humankind, while Ignace – her devoted butler – reluctantly accompanies her to the human world. Vivian learns about human technology and befriends mortals, bearing no ill will towards them. As they enter the human plane, their fates with Azura and Gallil become intertwined. 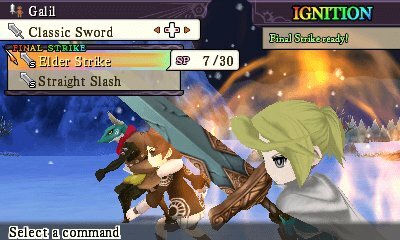 Alliance Alive’s battle system is traditional turn-based. You’ll start the game with two, and eventually add more characters as the story progresses. While nine party members join overall, your battle party consists of five party members at any given time. You’ll also use a positioning system to sort your characters based on rows. Among your row positions include bonuses for Attack, Defense, and Support. Equipping weapons allows you to learn new skills from them. This means using skills repeatedly till you learn new skills, which cost SP. Every battle lets you learn Talent, which are points that can be used to enhance your skills within a particular weapon field. As there are no “classes”, you’ll level them up yourself. Also, you’ll go to Guild Towers to meet NPCs. You benefit from the items you can get from talking to people, and the Guild Towers support you in battle. I found the battle system to pace itself fairly well. Much like Bravely Default, you can speed the battle system up by 2x or even 4x. You can use strategies, such as equipping Shield on someone in a Defense row, allowing them to shield the entire party, not just themselves. The Attacker can do more damage, and the Support unit can cast magic with Sigmancy. This allows for unique strategies. However, you might not need to use them often. Enemies fall quickly. And if you lose a member of your party, your party members will boost into a “Limit Break” mode where they power up and unleash a powerful attack. Bear in mind this will destroy a weapon – unless you’re using a Daemon with Grimroire Sword. Utilizing Formation – for Attack, Defense, and Support – is an option. I’ll go over more of the battle mechanics later in the review. The Alliance Alive’s strong point is its battle system. Besides Final Fantasy IV, only a handful of JRPGs allow you to utilize a 5-man group. Some key differences include that only Daemons can use magic, which allows them to utilize Grimroire Sword to break their weapons, as well as to augment their own stats. There’s no limit, as they can equip the same kind of weapons as humans. You will also get Beastfolk to join, such as Barbarosa, who comes equipped with an Axe. One member, Tiggy, remains in her mobile suit Swan. This allows her to have excellent defense and piercing strikes. Plus, all characters can fight Unarmed without unequipping weapons. This gives you access to barehanded strikes when Slash and Pierce weapons won’t work. The variety of enemy weaknesses gives the option for good strategies. I’ll touch more on the battle system later. Another quality of the game is the ease of travel. The game tells you which direction to go on the map, and travel is a breeze. As there are no random encounters, you’ll find all monsters come at you on the field. Dungeons have puzzles, such as lightning beacons and moving switches. Once you clear a dungeon, the game will give you the option to either walk back home or to quick jump to the last town. This improvement helps with pacing tremendously and keeps the player from having to do loads of backtracking. Plus, with the vehicles that you gain access to in the game, you can glide across valleys or even swim underwater. The Alliance Alive is derivative filled with cookie-cutter cliches. Gallil is the young, rookie resistance member and Azura’s his voice of reason. The smooth spy, Renzo, teases them about their relationship, to which they vehemently deny. Your mercenary buddies hold off the enemy while you escape, and two characters – a mage and mercenary – save you from the Beastfolk. One daemon likes humans while one is forced to do her bidding and comply, the prodigy is a small girl, and all the faces look the same. The art style and character variation is cute, but it lacks the element that even made Bravely Default stand out. To be honest, I find myself spending time distracted whenever I play. It’s hard to keep myself glued to this game for more than a few minutes at a time. The soundtrack is not engaging. It’s serviceable, but nothing is noteworthy or stands out. The story follows suit. Despite a world being controlled by Daemons and Beastfolk, there’s no sense of urgency in the story. It seems more like a passive adventure of “let’s go explore the world and see what lies out there.” There isn’t a bounty on Gallil and Azura’s head, and they’re not running from pursuers. With the daemons in their party, they get a free pass to places. Azura loses her eyesight early in the game, yet is never hindered. Her Signimancy allows her to sense things around her. It’s as if there was no point to losing her eyesight in the first place. Therefore, if you enjoy exploring lands, then you’ll enjoy the game for what it is. Story is the game’s weakest suit, but the battle system keeps the alliance alive. Emphasis on the battle of good. The Alliance Alive gives you tons of battle options. While the difficulty is mostly easy, it’s also fun to try new strategies. Around the 10 hour mark, you’ll gain access to five members, with several more joining later. The options you gain, from the amount of weapons you use, gives it a level of customization. You can give anyone a Shield so they can defend. But if you put them into Defense formation, that person can guard the entire group. You can’t always guarantee the block, so prepare well for enemies who use magic. Also, your formation determines how much damage you do to enemies. The closer you are to the front, the higher your damage is. This applies as well to enemy rows, as well. Anyone armed with a Bow or magic does not have to worry about this. However, enemies can still be resistant to Piercing attacks. If the battle options appeal to you, you’re in for a treat. The game takes a while to get to a progressively harder difficulty. But once you get there, you’re given ample options. Despite her bulk, Tiggy can’t use Shields, and thus, can’t defend the party. Sorting your character’s HP and SP is important, as those are the only two stats you upgrade in the game. Everything else is upgraded via equipment, and can be seen from a small graph by the character’s profile. I especially enjoy the types of weapon strikes that enemies are weak to as well. Categorized by Slash, Thrust, Blunt strikes, magic, and so forth, it adds another layer of strategy. It’s a solid cue that could be used for RPGs in the future. That said, the battle system is the game’s saving grace. Plus, it can be sped up by tapping the R button. The Alliance Alive is an RPG with its heart in the right place. It’s a game that paces its gameplay well and progressively improves its battle system. The scenarios split up amongst party members, in a fashion similar to Final Fantasy VI or Fire Emblem: Radiant Dawn. This means intersecting storylines that connect and unite once they meet the main characters. The world pacing is fast, the controls are intuitive, and while the visuals are by no means impressive, they’re not a drawback either. They’re serviceable, and if you like chibi-art, you’ll likely appreciate them. However, if you’re into story-driven titles, this isn’t the one. The story’s pacing runs at a slug’s pace, to which the emphasis is exploration over any sort of saving of the world. The dialogue is cliched and bland, with the occasional snappy comeback or raunchy line thrown in. If you’ve saved human beings from demons before, you’ll be doing it again for the duration of the game’s story. Note that the game lacks a 3D filter. Also, one of the most annoying parts I’ve dealt with is the Start button. A button normally used for menu and pause functions, expect to take many snapshots since, for some reason, they decided to make the Start button the snapshot button. You will likely be doing this accidentally over the course of the game. As a reminder, the menu is mapped to the Y button. Note the review title. A demo is available on the eShop. It runs roughly 2 hours and gives you an idea of the game’s story and gameplay. If you end up looking at your phone periodically instead of playing the game, it might not be for you. However, if you’re a JRPG diehard or just want to add to your library, Alliance Alive might be what you need.If the game is charming, but you’re feeling cautious, it might be worth waiting for a price drop. It is at least worth trying out. Did you enjoy our review for The Alliance Alive? Have you tried the demo or purchased the game? Please let us know your thoughts in the comments! 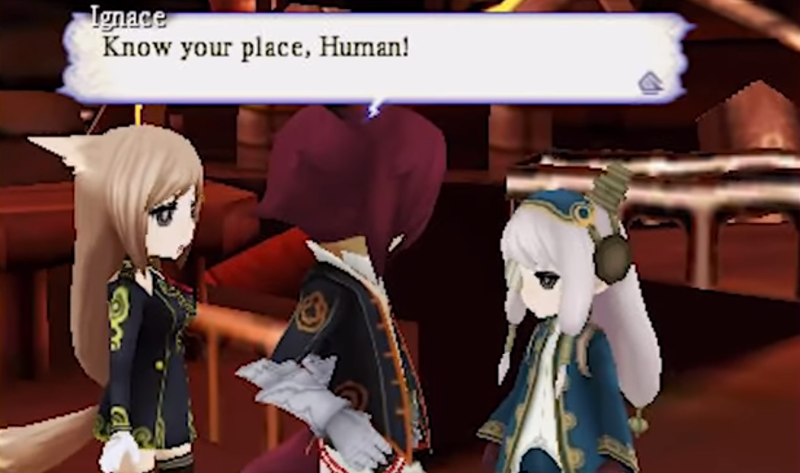 The Alliance Alive tells the story of humans fighting for their freedom against Daemons. While the battles are fun, the story lacks pacing. The visuals and audio are both bland. There's also zero voice acting in the game. This is quite jarring for a 2018 game. If The Alliance Alive was a bit more assertive in its writing, hired voice actors, and more diverse in its character design and art, I think it would be a really good RPG. Right now, it's passable at best.